south towards the howard frankland bridge. 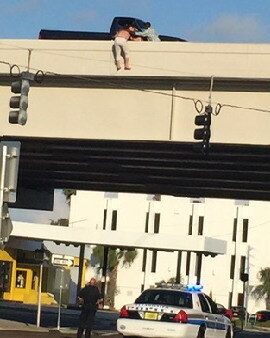 CLEARWATER, Fla. (WFLA) – Two men driving on the Bayside Bridge Wednesday stopped a woman from jumping and hanging herself. Justin Ludwiszewski said he was driving north on McMullen Booth Road during rush hour, when he spotted a truck in the emergency lane. “I noticed that there was a woman who seemed to be sitting on the side of the bridge on the concrete barrier,” he said. He said he felt something wasn’t right. “She seemed a little agitated. If her truck was just broken down, or if she was upset or what, then I noticed that she had a cord, and I just had a sinking feeling in my gut that she was trying to hang herself,” said Ludwiszewski. Ludwiszewski said he stopped his car and jumped out once he realized the woman intended to jump and hang herself. “I saw the noose around her neck, I saw that it was tied to her truck and when she went, I was able to grab onto her arm and just use the concrete barrier to keep her from going all the way over,” he said. He said as soon as he reached for the woman, she turned around, looked at him and then leaped off the ledge. With seconds to spare, Ludwiszewski said he reached out and caught her arm. Clayton Lopez was driving by. “When I looked I noticed two bodies, and noticed one body wasn’t there anymore,” he said. He said the woman was screaming to let her go. That’s when he yelled for help. Lopez made it to him just in time. “I was scared to death that I wasn’t going to be able to hold on and I’d have to watch this woman fall and die,” said Luswiszewski. Lopez grabbed the woman’s other arm and helped Ludwiszewski pull her safely, back over the ledge. Emergency crews responded and took the woman to a nearby hospital. What: Deputy Jose Camacho talked with a Spanish speaking male subject as he stood on the catwalk of the Bayside Bridge, threatening to jump. After about two hours, the man surrendered and was transported to a local medical facility for mental evaluation. Where: On the southbound side of the Bayside Bridge. Both sides of the bridge were closed to traffic during this incident. When: Monday, January 21, 2008, from approx. 8:30 p.m. until about 11:10 p.m.
How/Why: A man threatening suicide by jumping from the Bayside Bridge was eventually talked to safety by Pinellas County Deputy Jose Camacho, with the assistance of other local agencies, and crisis intervention representatives. Speaking Spanish only, the subject, Jamie Gonzalez-Victoria had driven his car towards the center of the span, on the southbound side. Deputy Camacho was enlisted to communicate with the subject, who threatened to jump. The man said he was having marital problems and could not see his children. In the interest of safety, both sides of the bridge were closed by assisting agencies during the negotiation. At one point Gonzalez-Victoria slipped under the bridge on the catwalk and prepared to jump - hanging on by a pipe. Eventually he surrendered, and was taken for evaluation to a local medical facility. 09.30.07, tbnweekly.com, PINELLAS PARK – A Pinellas Park man died after jumping from the Bayside Bridge on Saturday afternoon. According to a report from the Pinellas County Sheriff’s Office, Dong Van Bui, 27, jumped from the bridge about noon in an apparent suicide. Detectives said witnesses reported seeing Bui stop his beige 1994 Nissan Altima on the northbound span of the bridge sound of the hump before jumping. The witnesses called 911. They were unable to reach the victim in the water below, the report said. Sheriff’s Office marine units and a helicopter crew, as well as Clearwater Fire and Rescue responded, and Clearwater paramedics located the victim in the water. He was transported to Mease Countyside Hospital in Safety Harbor hospital where he was pronounced dead. In accordance with Sheriff’s Office policy detectives from the Homicide Unit will conduct the death investigation and an autopsy will be performed to determine the cause and manner of death. No other injuries were reported and the investigation continues. 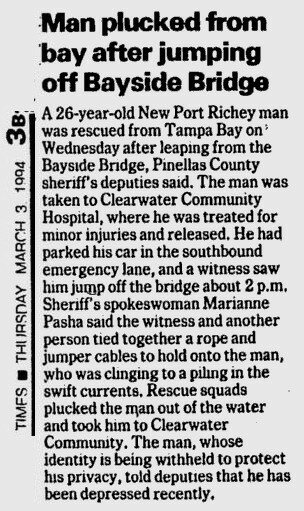 03.06.01, sptimes.com, Despite three flat tires, the man evades deputies only to be grabbed by the Coast Guard after jumping from the Bayside Bridge. CLEARWATER -- After a 7-mile chase Sunday night that reached speeds of 100 mph, the wounded Ford F-150 rolled to a stop with three flat tires on the Bayside Bridge. Deputies figured they had their man. But then he surprised them again when he jumped from the pickup's passenger-side window and over the side of the bridge -- naked except for his boxer shorts. JJonathan Michael Green, 20, of [withheld], St. Petersburg, splashed into the waters of Tampa Bay about 25 feet below. Inside the truck, deputies found a pair of jeans and a shirt he had shed before his plunge, said Sheriff's Office spokesman Cal Dennie. A Sheriff's Office helicopter kept a spotlight on Green, who clung to a pylon. A U.S. Coast Guard boat plucked him from the water minutes later. He was treated at a local hospital for scrapes and potential hypothermia and then was brought to the Pinellas County jail. Deputies charged Green with fleeing and eluding officers, reckless driving, possession of marijuana, possession of drug paraphernalia and obstruction. He was being held at the jail Monday evening pending $6,000 bail. Green's father said his son called him from the jail Monday morning. He was surprised to hear what his son was accused of doing. "I know he knows how to swim, but it surprises me he would go to that extent to evade the police," Joe Green said. He said his son has a wife and two children, ages 2 and 3. He said his son has been in trouble with the law before, but not to this extent. "He started running around with some bad apples out of the barrel," Green said, adding that his son usually talks to him "only when he's in trouble or wants something." The ordeal Sunday began about 11 p.m. when deputies saw Green's truck speeding south on McMullen-Booth Road near Curlew Road, Dennie said. Deputies began chasing but backed off when Green's truck reached speeds near 100 mph, Dennie said. They put a set of stop sticks, which contain tire-piercing spikes, at County Road 580. The truck ran over them but kept going, Dennie said. Deputies radioed south to other deputies, who cleared intersections and set up stop sticks to try stopping the truck. They set up another set at Enterprise Road with the same result. The truck also ran over a third set put down at the Drew Street intersection, but the truck kept plowing ahead, three of its tires now slashed, Dennie said. After striking a concrete barrier on the bridge about seven times, the truck stopped at the bridge's hump, where Green jumped. If not for that slight incline in the bridge, Green may have kept going, Dennie said. "We were worried about the currents of Tampa Bay taking him," Dennie said. The U.S. Coast Guard boat fished Green out of the water about 11:45 p.m. Deputies brought him to Mease Countryside Hospital for treatment. He later was taken to St. Joseph's Hospital in Tampa to be treated for possible hypothermia, Dennie said. He was booked into the Pinellas County jail at 5:42 a.m.
Dennie, who said deputies followed all proper chase procedures, said the pursuit was one of the more unusual he's seen in Pinellas County. "It's the first time that we've had to use three sets of stop sticks," he said. "And then for someone to take that drastic of a measure to get away."